The Puget Sound Partnership is re-evaluating the way it measures the health of Puget Sound. 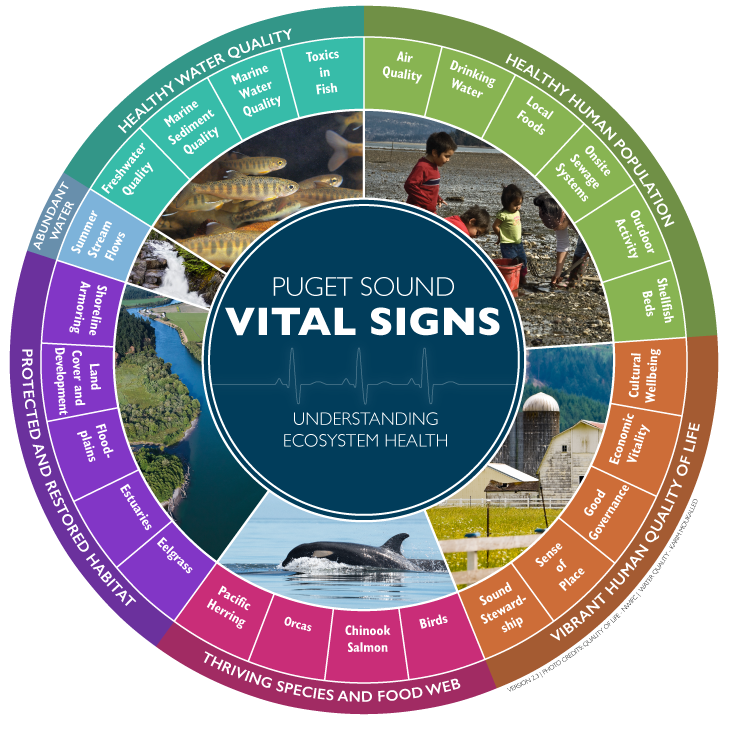 A newly published study could greatly expand the Partnership’s portfolio of Vital Signs, a collection of health indicators for the Puget Sound ecosystem that have been central to state and federal funding and planning. A key goal of the state’s Puget Sound recovery strategy has been to identify and focus on the most critical areas of concern for the ecosystem. The Partnership, the state agency coordinating the effort, has officially adopted 47 such categories — known as indicators — ranging from orca recovery to removal of shoreline armoring. Those indicators have been at the core of the state’s Puget Sound work plan, but a review by the Washington State Academy of Sciences (WSAS) found “significant flaws and inconsistencies in the process” used to select them, according to the report. The WSAS faulted the current Vital Signs as being too narrowly focused while “a sufficient number of key attributes for the Puget Sound system were not measured,” the report said. It also took issue with some of the indicator evaluation criteria. Additional proposed indicators include: Monitoring of the extent of wetlands and forested marine shoreline, river and stream habitat, estuary area and function, frequency of flooding events, the timing of peak stream flows, monitoring of chlorophyll in marine waters and streams, pesticides in small streams, toxics in resident fish in lakes and rivers, and sediment supply to nearshore areas and rivers. Two indicators related to freshwater quality and sediment were removed or recategorized. The report does not address an additional set of human wellbeing indicators that were established for Puget Sound in 2015.